At October the 15th 2005 in southern Germany was one of the greatest Halophenomena, which has ever been observed in Germany. It was photographically documented by six observers on a latitude of 100 km. 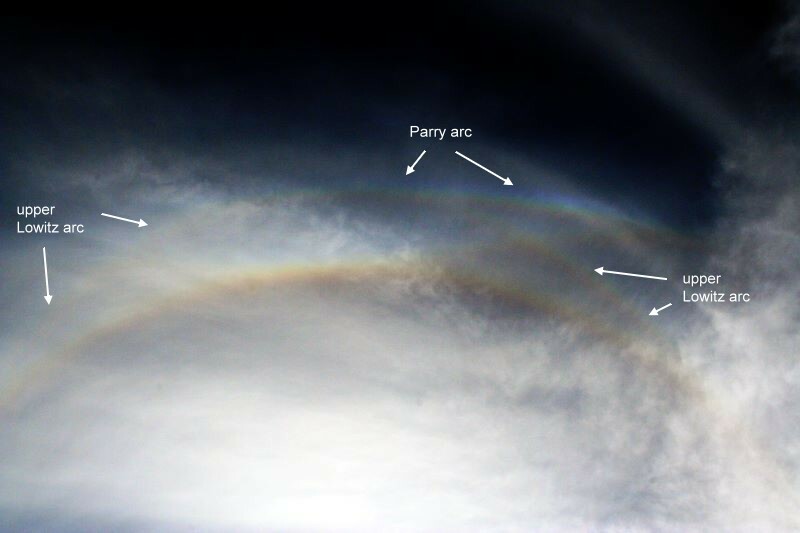 There was seen a bright 22° halo, glittering bright sundogs with absolute clear colours and a high part of blue, a complete and bright upper tangent arc, a reddish lower tangent arc, a highly coloured and complete Circumzenithal arc, a light-coloured and nearly complete Parhelic Circle, the complete Lowitz arcs, the Anthelion, the 120 deg parhelia with oblique arcs, a single Superlateral arc, both Infralateral arcs as well as a beauty of Parry arc. Altogether there were seen 15 miscellaneous Halo types with 20 appearances. Yep I remember that display, I like the upper lowitz arcs, the parry arc and nice parhelic circle.